The ancient port of Xiamen is better to known to history by its name in the local dialect: Amoy. It was one of the five “Treaty Ports” established after the First Opium War, and became a center of international trade. As a result Amoy dialect gave the word “tea” to the English language, as well as several others, including “ketchup”. Today though, it’s best known as a seaside resort and as the gateway to Taiwan. If you’re passing through en route to Taipei, as my family and I were, then it’s well worth taking a couple of days to discover this beautiful city. Xiamen was founded on an island, although it has now spilled onto the mainland, and extended out to form a single conurbation with Quanzhou to the north. 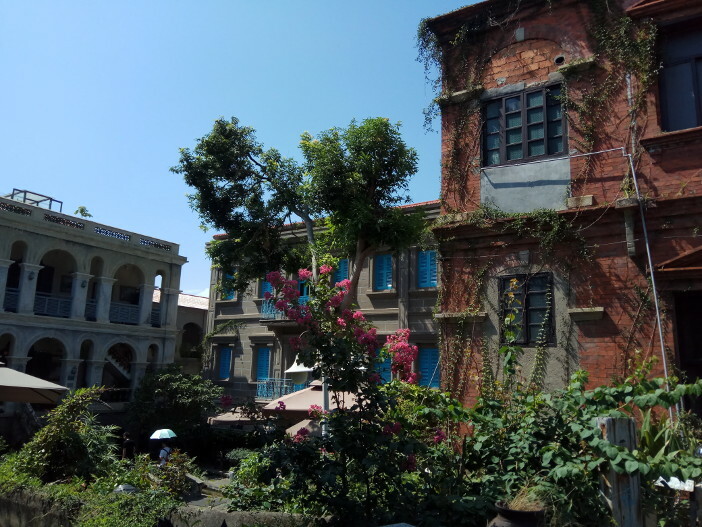 If you’re visiting for pleasure, you’ll probably want to stay on the island itself, in the old Siming district. Taxis are plentiful and cheap, though at the time of writing extensive roadworks make for long jams. The city’s metro is still under construction and currently consists of a single line, which at least offers a quick way of getting from the main railway station (Xiamen North) to the island. 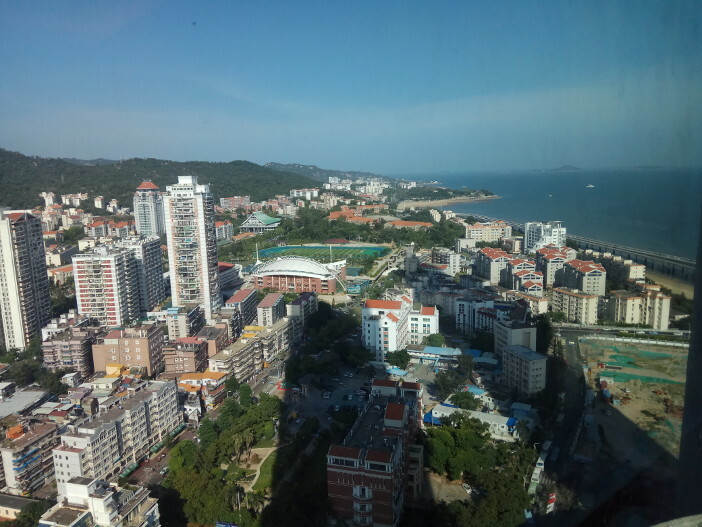 Xiamen’s beaches are lively and well-maintained, though as you might expect from a port city on the South China Sea, the water is not the cleanest we’ve ever swum in. The main attraction, however, is the neighboring island of Gulangyu. This was where the colonial merchants and administrators built their villas, and it’s now a Unesco World Heritage Site, and a major tourist draw. Getting to Gulangyu is not straightforward. There’s a separate ferry service for locals, but tourists are funneled through busy Dongdu wharf. If it’s possible for foreigners to book online, then it was beyond our powers at least, so we simply turned up at the port and queued. As with many things in China, the system looks chaotic but works, and after a ten-minute wait, we were able to get tickets for the next ferry. However, if you arrive early in the day or at a weekend, you might have to wait an hour or two before you can sail. Boarding the ferry involved an unedifying spectacle of shoving and line jumping, which ultimately seemed rather pointless for a thirty-minute crossing on a boat with few facilities. (Top tip: the enclosed cabin, with more comfortable seats, looks like it might be reserved but isn’t. Get in there, if you don’t mind missing the sea breeze.) Be aware as well that not all the ferries have toilets. Make sure younger children go before you board! On arriving at Gulangyu, we’d recommend getting away from the overcrowded wharf area as quickly as possible. The east coast of the island is packed with tacky tourist traps, and the real joy is just wandering around the labyrinth of narrow streets, spotting examples of the fabulous colonial architecture and soaking up the atmosphere; like a Mediterranean town transplanted to the South China Sea. We spent several hours there without paying to go in anywhere, or “doing” anything other than eat, drink, and wander. While in Xiamen we also visited Hulishan Fortress. (This was an easier sell to my boys than Nanputuo Temple. After three years in China, they are, they wearily inform me, “templed out”.) 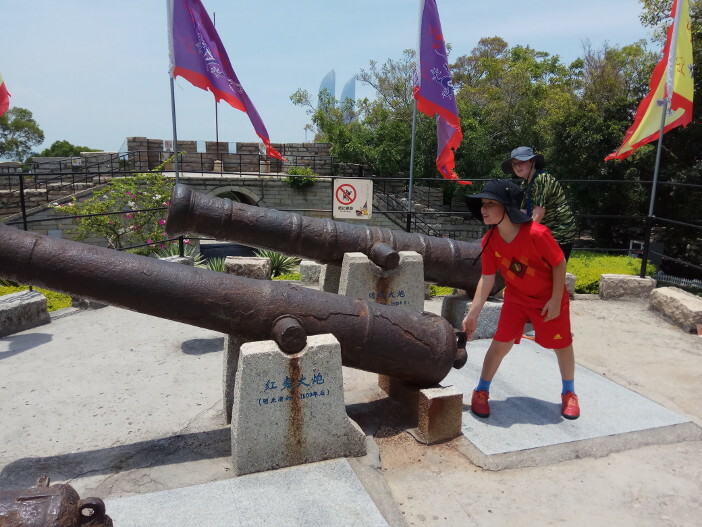 The fortifications were built in the late nineteenth century, in a belated attempt to modernize the Qing military and guard against Japanese aggression. They’re still mostly original and in good condition, and it’s a well-planned attraction with lots to do. 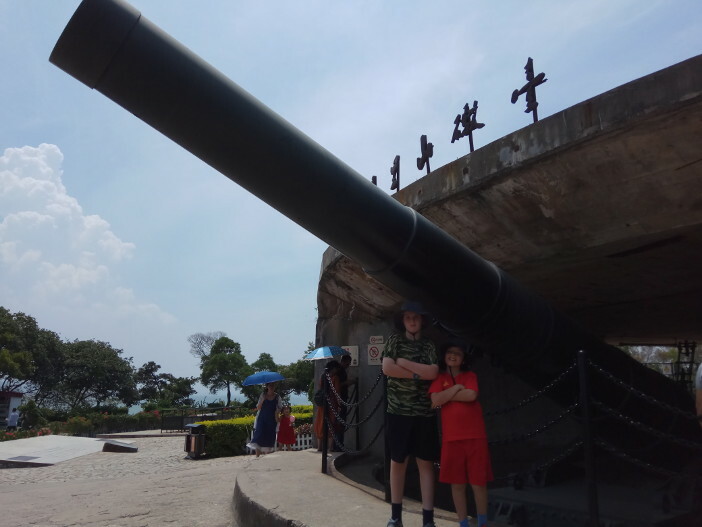 The pride of the fortress though is the world’s oldest and biggest coastal gun. 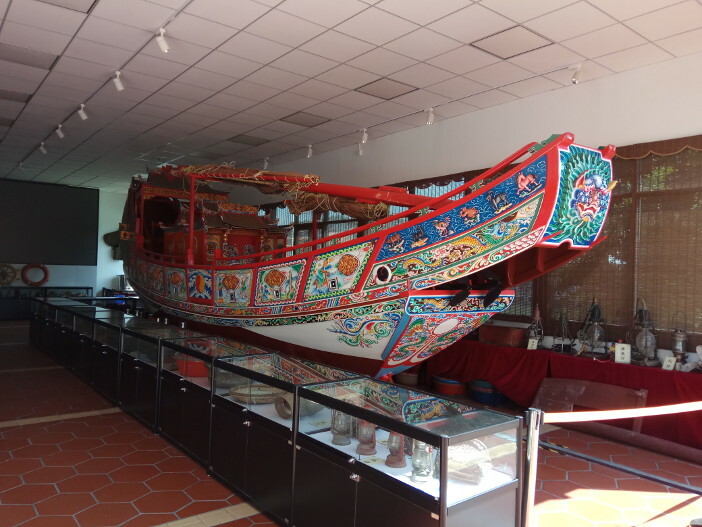 This was purchased from the Krupp company in Germany in 1894, and transported halfway around the world to be sited in Xiamen. If you like big guns (and you cannot lie), then it’s an undeniably impressive sight. 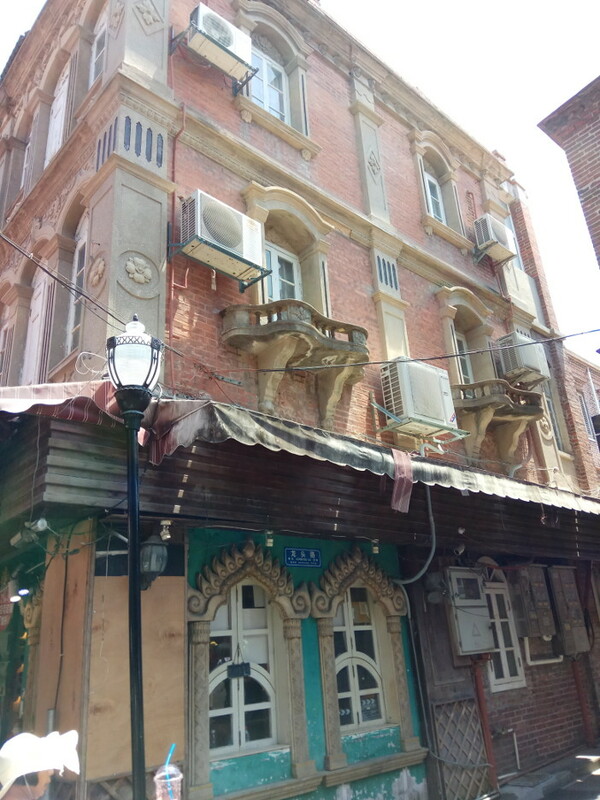 Xiamen is an attractive city, with chic fashions, hip cafes, and some great restaurants (the ice chicken cooked in champagne with fruit salad at Phoenix Wen was a particular treat.) After two days however it was time for us to move on to Taiwan, and that will be the subject of my next post. Hello. How did you travel from Taipei to Xiamen? Could you help me? Thank you! Hi Mae! Thanks for your comment. If you follow the series of posts, you’ll see we went the other way… We took the overnight ferry from Xiamen to Keelung, then went from Taipei to Taitung, and on to Lanyu. Coming back we flew from Taipei to Beijing (via Macau, which was for some reason much cheaper…) But the usual way is to get the ferry from Xiamen across the short hop to Kinmen Island, and fly on from there to Taipei.